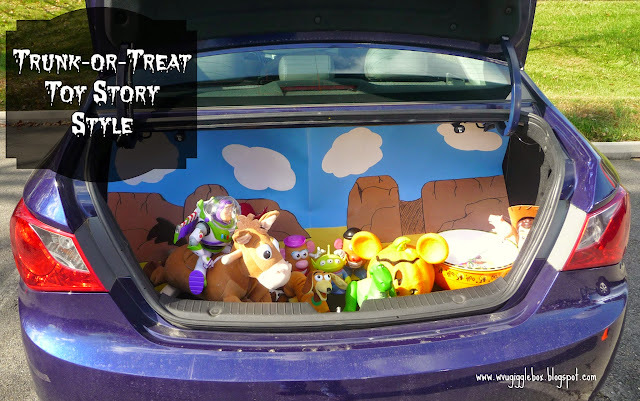 I did a search on Pinterest for ideas and the only Toy Story one was making your trunk look like Andy's bed. 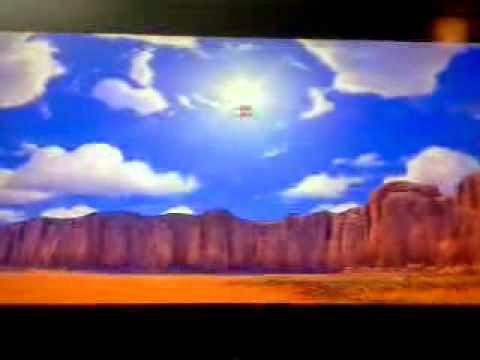 Jon wanted to do more of a western scene like in the beginning of Toy Story 3. I looked for a picture of the scene we wanted to recreate online and then went from there. This the scene I found and liked, but wasn't too sure on how to make it look like that in my trunk. I went to Walmart and bought two blue and one white poster boards. I already had construction paper from some crafts we did last year. 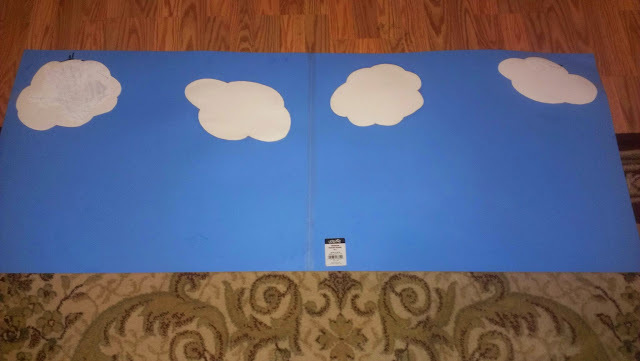 I taped the two blue poster boards together and on one side of the white poster board sketched out clouds. I then cut the clouds out and glued them to the blue posters. Not sure that you can tell in this picture, but Michael had decided that one of the clouds should be black. He took a black permanent marker and colored almost the whole entire cloud black. Luckily I had white paint to cover it up. When Jon got home from work he cut and glued the brown pieces to look more like the mountains. He also took yellow construction paper and glued it to the bottom of the poster boards to look like the desert sand. 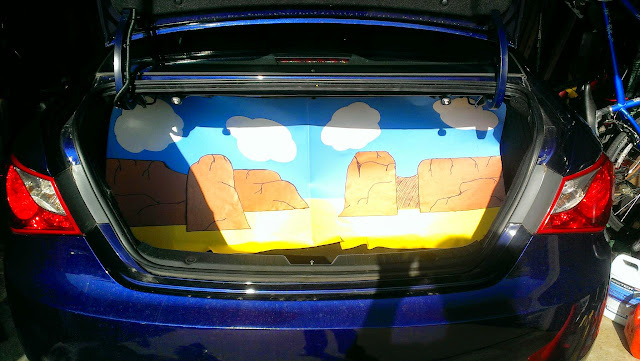 He actually had it extend out further than the end of the poster boards to give more of a seamless look in my trunk. Setting it up at home and test fitting where I would place all the toys. It fit perfectly in my Hyundai Sonata trunk. 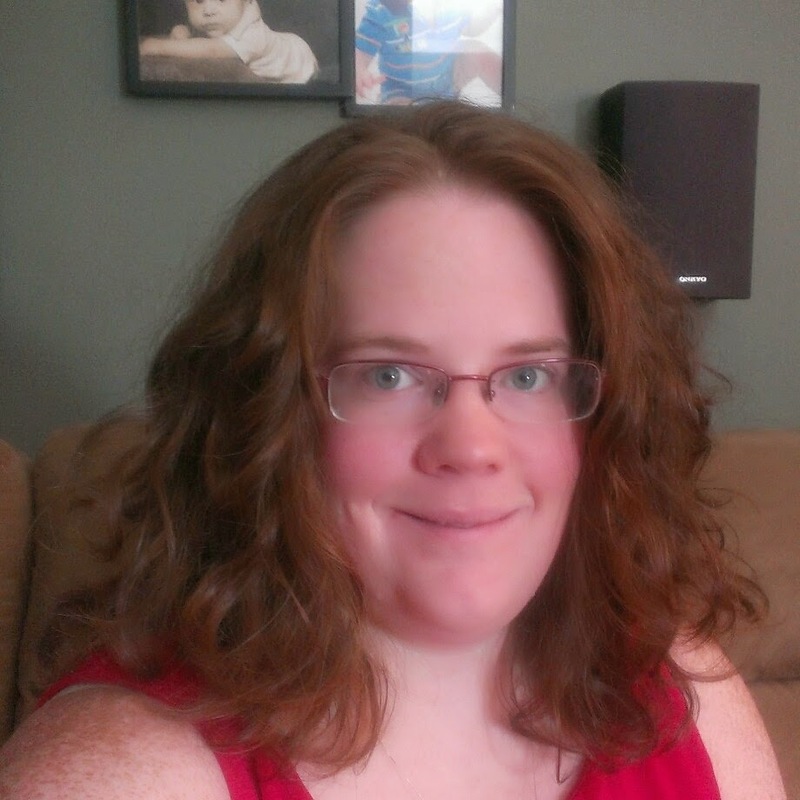 I was worried that I was going to have to cut it so it would fit. One of the other moms knew that I was doing a Toy Story theme and asked if I needed any characters. She was nice enough to let me barrow Slinky Dog, Ham, and a Buzz Lightyear who's hand wasn't broken off. We already had a big Bullseye and Mr. & Mrs. Potato Head. I had bought the alien and Rex the day before at Toys R Us. I decided to put in my Mickey Mouse pumpkin to give it a little Halloween flair. The kids and parents loved it. I might do this again next year for trunk-or-treat. Michael had a blast participating in trunk-or-treat and really got a good hall of treats. What ways have you decorated your trunks for trunk-or-treat? I saw some great ideas for mini-vans and suvs while I was doing my search.